I was sure I’d read somewhere that being blasted in the face at high-speed by sand and being sprayed with salt water was good for the complexion. But then I’ve seen loads of craggy old fishermen with skin like a chimpanzee’s private bits so maybe salt-based exfoliator isn’t good after all. Especially when mixed with sunshine, wind and sweat. I bet those craggy ‘old’ fishermen are only in their early thirties as well. The equivalent of the ‘hard paper round’ bloke who’s really twenty years younger than he looks. Like an idiot, every village has got a Hard Paper Round Man. I concluded, while I was being blasted in the face by the aforementioned sand, wind, rays of UV and salt that this probably wasn’t ideal if I wanted to keep my youthful good looks. Stop sniggering. The alternative was to ride my bike just a little bit over to the left, away from the spray from the wheel in front, straight into the block headwind that was howling across the beach. I’d be getting sprayed less, but it’d be lonely and quite a lot slower. Knowing which side my bread is buttered, I stayed in the pack. I knew that this was the chasing pack (in fact, it was the pack that was chasing the chasing pack) but it was moving plenty fast enough. I’d stay where I was for a while until I warmed up properly or at least until later laps where there’d be less people to witness my probable failure to bridge to the next group. Beach racing, it would seem, was my new Favourite Thing. After the melee of the first few hundred metres and the first encounter with the beach itself (where the soft stuff that never gets wet had to be crossed before getting to the hardpacked, rideable stuff) I must have been 50 places from the front, but it was still brilliant. ‘Epic’, even. Only 3k of this then the delights of a scramble up a loose, near-vertical cliff of sand then 10 kilometres of some of the most enjoyable woodland singletrack I’ve ever ridden. There were a few VERY deep puddles but we’ll not mention those on account of them being spectacularly horrible on a bike with tyres that are rather….erm…buoyant. Lap one done. I’m still miles behind the sharp end of this race but I’m passing people fairly regularly and I’m enjoying myself. I’m racing everyone, whether they’re on cyclocross bikes, mountain bikes or fatbikes, as you do, but I was in a separate fatbike category of like-minded attention-seekers and I knew that there was 4 of them in front somewhere. 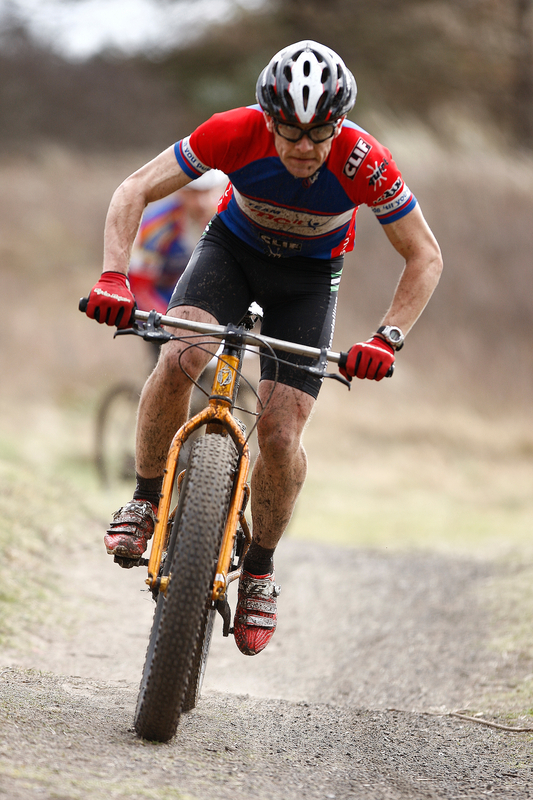 In actual fact, this was the 2014 UK Fatbike Championship, so I guess that I was the current title holder. It was 12 hours long in my day though…! Here’s the beach again. Comedy soft sand bit. Now the firm stuff and I manage to get into a group again. Somehow I’m managing to do my turn on the front for a while in spite of my four inch-side tyres with 15 psi in them. Blasted in the face a bit less but it seems to be getting windier. Rumbled to the front a couple more times, head down low, desperately scanning the beach for the flags indicating the near-vertical loose sand scramble and the start of the singletrack. Moved into 4th place after getting past a fellow attention-seeker. I reckoned that Julian (a friend and someone I’ve raced with a few times in the past) was only a short distance in front. That was confirmed when I finally caught sight of him on the final fun section before the end of the second lap. One lap to go. Close this gap and get past. Here’s the beach again. Just three of us in our merry band this time. Mel Alexander, Jo Burt and me. We each did our bit and despatched the final slog across the sand without too much fuss. I could see the group that Julian was in about 500 metres ahead. Not long now. Caught Julian just after the start of the singletrack. He turned his head almost telepathically and spotted me closing in. Then he went faster. Much, much faster. The entire 9 or so kilometres of the final lap was ridden wheel-to-wheel and I knew that the only way I was going to get past safely would be to somehow force Julian to make a mistake and ride into a bush. I had no idea how I was going to force a mistake. All I could do is chase him, Benny Hill-style, through the woods. An error, forced or otherwise, didn’t happen. Julian rode an absolute blinder of a lap and on the quiet, I had to ride out of my skin just to stay in close contact. Inevitably, the final podium spot was decided on a sprint for the line…..
….and I lost. By about 2 seconds. Far from being disappointed, that final lap – from the friendly cooperation on the beach to the almost-slapstick battle of the fatbikes and the manly man-hugs and handshakes that followed made the trip all the way to South Wales and back again more than worth it. Battle on the Beach was universally hailed as a success by all who turned up and raced. Organiser and 24 hour-racing friend Matt Page is quite rightly proud of what he organised and thankfully, he’s doing it all again next year. Thanks to Shona and Rich (yet again!) for the loan of the bike and thanks to Dave’s Angela for making me a brew when I arrived on the morning of the race, for handing up bottles during the race and making me a bacon butty after it. You look so butch, lean and mean, Jase. That is all that matters. Sprints get forgotten. Photos are forever. correct. glad you noticed. anyway, gotta go…late for the gym.